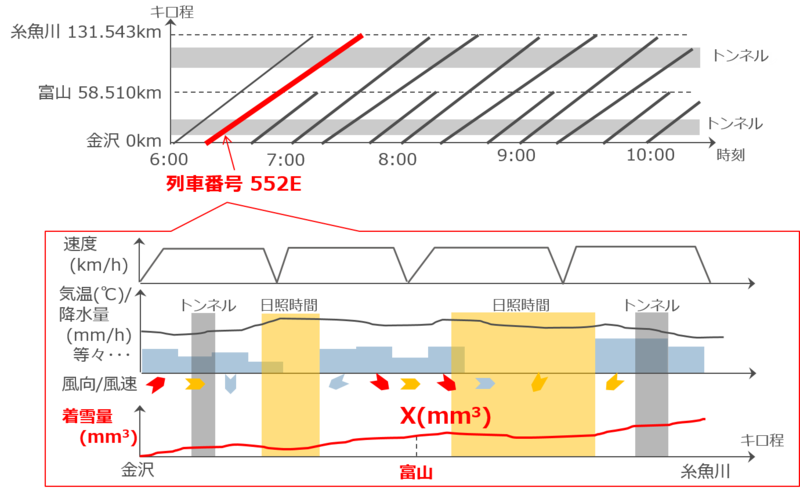 When high speed rail rolling stock, Shinkansen, travels during snowfall, snow adheres on its bogie part. An increase in the amount of adhering snow may cause its falling into the track. This falling has a risk of destruction of track infrastructure and so on. Therefore, prediction of the largest amount of adhering snow on the bogie with the risk of falling on the day is required in order to make a decision on the necessity of the next day's removing adhering snow on the previous day. For this reason, improving the prediction accuracy of the amount of adhering snow is expected super effective to support deciding on the necessity of removing snow on the next day. In the competition, participants will create a model that predicts the amount of adhering snow quantitatively by analyzing historical data of weather conditions, traveling conditions and amount of adhering snow. Though it may be a very complicated problem as it requires viewpoints of both meteorology and railway operation, we would like to make use of your great ideas, technical skills, and creativity to find an innovative solution and keep on improving the quality of railway operations. The following data is given for creating algorithms (see Download Data page for more details). Amount of snow accumulated on the railway bogie part measured by laser scanner when the railway stops at Toyama station and Itoigawa station. These data include kilometrage and longitude / latitude information of civil engineering structures (railway station / tunnel) and JR-owned measuring instruments (anemometer / snow depth meter). Diagram: Indicates common timetable corresponding to each train (local and express) ID. Train without adhering snow at the arrival of Kanazawa station: It indicates the ID number of train whose amount of adhering snow is zero at Kanazawa station as it leaves from Rolling stock maintenance depot to Kanazawa station. As for the other train ID numbers, the amount of adhering snow is unknown as they turn back at Kanazawa station. Of the historical meteorological data acquired from Meteorological Agency, we have extracted data with following condition. ※Other than the above condition, participants can use open data as long as they are free. Data measured in seconds by anemometers uniquely set up (at 20 points in total) by JR West. Wind speed (Instantaneous): Measured in units of 0.1m/s. Wind direction (Instantaneous): A direction given by degrees. North corresponds to 0°, and the angles increase clockwise. Depth of snow measured on track surface and on trench located at the outside of the railway track. Depending on the set up and measurement point of snow depth gauge, the data to be utilized may vary. For more details, please refer to [doc_1.pptx]. 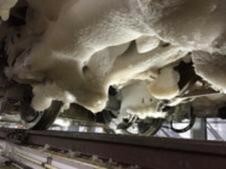 Adhering snow: Amount of adhering snow on the rolling stock bogie. Kilometrage: Accumulated distance from Kanazawa station, which indicates a location of station, tunnel, and each measuring instrument. Train ID: An identifier given to each train in a diagram. Submissions are scored on the WMAE (Weighted Mean Absolute Error). The ratio of weights is the sum of 1 and the absolute value of the true value multiplied by 10 ^ 4. ・In predicting y at time t, you may use the information available until time t.
①From Meteorological Agency database, participants can use hourly information of temperature, precipitation, wind speed, relative humidity, and weather during the same day as the target date of prediction. These information are provided by Japan Weather Association and are forecasted the day before. data with index before 2017-01-12 00:00:00 can be used. Please note: 24:00 of one day is the same time as 00:00 of the following day. ② From Meteorological Agency database, data of snow depth, anemometer and the other items not listed in the above ① can be used as long as they are disclosed on or before 4 AM on the target date of prediction. Participants can also use external data as input data as long as they can be acquired on or before 4 AM on the target date of prediction. data with index before 2017-01-11 04:00:00 can be used. ③ Please not that the weather information (other than ①) considered necessary for improving prediction accuracy of the amount of snow accretion can be used as secondary input data by estimating the relationship with (primary) input data of ① (See figure below). ・Creating a predictive model by plagiarism or plagiarism of an existing research is not permitted. Though participants can only use temperature, precipitation, wind speed, relative humidity, and weather as input data for prediction dates in this competition, we would like to introduce the ideas to estimate other weather conditions from the meteorological point of view based on these meteorological conditions (*For more details, please refer to [doc_2.pptx] on the data download page). Precipitation during snowfall indicates the depth of water when the drifted snow melts into water. Amount of snowfall indicates the depth of snow (snow depth) that has been precipitated. Even with the same precipitation, the value of snowfall will change depending on the density ratio of water and snow. Since it is shown that the density of snow changes depending on the temperature from past experimental law, it is possible to estimate the amount of snowfall from the temperature and the precipitation during snowfall. The amount of solar radiation is an indicator of the strength of energy due to the sun's sunshine, and an increase in the amount of solar radiation during snowfall or snowfall acts in the direction of melting snow (the snow density increases). It is possible to estimate based on the relational expression between sunshine hours and solar radiation at a point where solar radiation data is not observed. As will be described later, it is possible to estimate the sunshine hours from the weather. It is possible to find a correlation between weather and sunshine duration by analyzing statistically based on the historical weather data. For reference, we show the relationship between weather and sunshine duration in case of using the Meteorological Agency data of Kanazawa city which is prepared in this competition. By using the above relation, it can be used to estimate the sunshine duration condition at the point where the sunshine duration is not observed and the target date of prediction.